When/Why Did You Start Running? 30+ years. I started at the age of 9 through a recreation track program and then took a few years off in my 20's. I fell back in love with the sport and hope to run until forever! 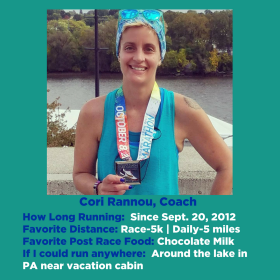 Favorite Distance: As much as the training hurts, I love running marathons. For triathlons, I love the Olympic distance. Favorite Post Race Indulgence: Hands down - a good burger and a freezing cold coke. If it's followed by anything chocolate, well, that's a bonus! If You Could Run Anywhere, Where Would it Be? Anywhere along the coast. I love to see and hear the ocean. If You Could Run Anywhere, Where Would it Be? When/Why Did You Start Running? I've been running about 10 years (strictly as a runner). Prior to that 25 years to stay in shape for soccer. If You Could Run Anywhere, Where Would it Be? I'd love to run the Rome Marathon.